The OMEGA ® LVK-90 single station horizontal level switch is cost effective for level control applications in small tanks where it is more convenient to install a level switch through the sidewall of the tank. When the float arm is raised to the switch housing, the switch is activated. As the float drops away from the housing, it is deactivated. 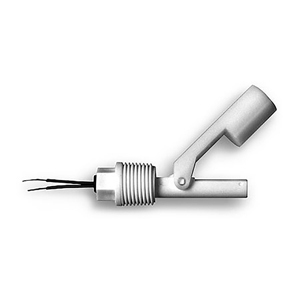 The movement of the float brings the imbedded magnet into close proximity to the encapsulated. The switch is made from Polybutylene Terephthalate and has a 20 VA rated switch.